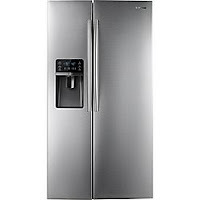 This week's featured appliance is the Energy Star-rated Samsung 29.6 cubic foot side-by-side refrigerator (RSG307AA). The exterior of this refrigerator is consistent with Samsung's other refrigerators, with contoured doors, curved tubular handles, smooth surfaces (in white and black), and adds the new flat logo (previous models have sported raised logos). Despite having almost 30 cubic feet of storage space, it maintains the same footprint and height as models with 25-28 cubic feet (it fits in a 36" wide opening). The control panel on the water/ice dispenser is a sensor-based glass panel, so cleaning is easy, with no buttons to wear out. The cabinet is gray, and the hinges are concealed behind the facade of the doors, for a seamless and clean appearance. The RSG307AA has Samsung's Twin Cooling Plus technology, which circulates the air in the refrigerator and freezer compartments independently so flavors and odors don't move from one compartment to the other. This prevents garlic ice cubes and other yucky odor transference. It also maintains proper humidity levels, which extends the life of the food in both sides. The freezer compartment has 11.5 cubic feet of space, so you'll have plenty of room for all of your frozen food. An icemaker is mounted on the door to give you more shelf space inside the freezer. The ice maker offers crushed or cubed ice. Interior lighting is exclusively LED-based, which means less energy use, more space, and no more bulbs to replace. Five tempered glass shelves and two baskets give you lots of flexibility for storing and organizing your frozen food. There are also three door-mounted bins for smaller containers. The refrigerator compartment has 18.1 cubic feet, which is lots of space for fresh foods and leftovers. Again, all lighting is with LEDs to help maximize storage space, reduce energy use, and keep temperatures down when the door is open. Four shelves (including the top of the upper-most drawer) and three drawers at the bottom give you lots of places to keep your food, and three drawers offer plenty of room to keep your fruits, vegetables, meats, and cheeses fresh and delicious. Three gallon-depth bins on the door allow you to keep plenty of milk and other beverages conveniently stored within easy reach for everyone at home. There's also a fold-up can storage rack to keep cans of soda (or beer, if that's your thing). There's even a bottle storage rack under one of the shelves to store bottles of wine (or other bottles). The filter for the water system in the refrigerator is in the bottom right corner, so it's out of the way, easily accessible (no need to move anything to get at it), and should be changed every 6 months. The filter for this refrigerator is available here. If you're a fan of the side-by-side style refrigerator and you want maximum capacity along with beautiful styling and great performance, the Samsung RSG307AA is a very good choice.